The work formally concludes the skills governance review the agency has been carrying out since 2017. The Education Ministry’s State secretary Oľga Nachtmannová opened the event. After a video message from Cedefop’s Acting Executive Director Mara Brugia, Acting Head of Department for Skills and Labour Market Alena Zukersteinova welcomed participants and explained the rationale and working methods of Cedefop’s skills governance reviews. Cedefop expert Jasper van Loo provided an overview of common challenges in skills governance and possibilities to address them, and presented results from a wide consultation among stakeholders in Slovakia. Cedefop expert Vladimir Kvetan led a discussion on how to strengthen the links between data and policy-making, drawing on the current situation in Slovakia, experiences in neighbouring Czechia and the latest in the development of skills intelligence. 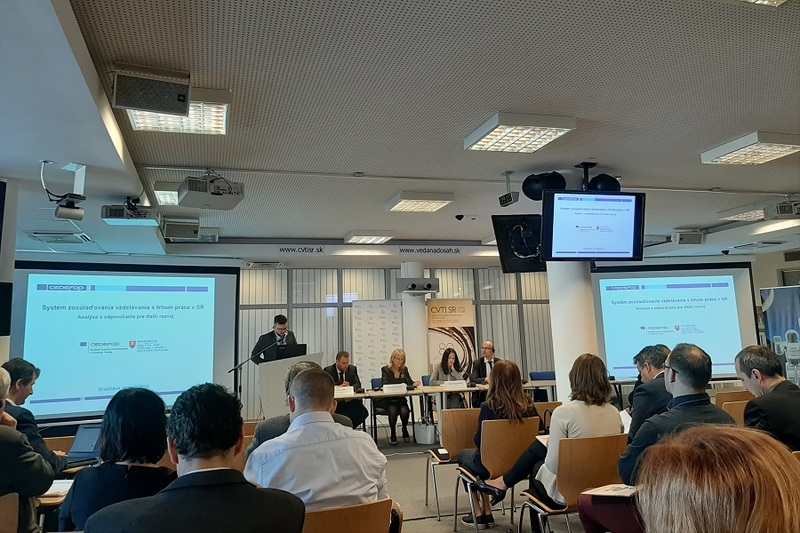 Cedefop’s analysis helped provide a comprehensive overview of what policy-makers and practitioners in Slovakia think about current practices aimed at ensuring effective links between the education and training system and the needs of the labour market. The analysis, which also included suggestions for change, was based on a wide consultation of stakeholders, including ministries and their agencies, social partners, research organisations and self-governing regions. Employers and vocational education and training institutions were given the opportunity to have their say in an online opinion survey organised by Cedefop in early 2019. The findings pointed towards three main issues: coordination problems and fragmentation of responsibilities, challenges in ensuring that data and information on skill needs find their way into practice, and bottlenecks in implementing policies to ensure well-functioning links between education and training in the labour market. Participants in the panel discussion did not view these findings as surprising. State secretaries Nachtmannová and Branislav Ondruš (Ministry of Labour, Social Affairs and Family) said that the bottlenecks and the way stakeholders think about them are known. The analysis, however, made it possible to see the links between different challenges, and the system perspective on how to improve the governance of skills anticipation and matching highlighted how crucial cooperation between key stakeholders is. Participants also valued the open and honest views the Cedefop work transmits on the state of skills governance in Slovakia. The state secretaries pledged to ensure closer collaboration between their ministries and announced actions to strengthen skills governance in the near future. A new data exchange agreement between the education and labour ministries, to be signed in the coming months, will help to follow learners and workers better over time. Tracer studies and other types of data collection will also be launched. The sectoral councils will be revamped shortly and one of their first tasks will be to develop a 20 to 30-year strategy to strengthen the country’s skills system. Work on strengthening lifelong learning is also on the policy agenda. Cedefop will follow developments in Slovakia with great interest and – where possible – continue to support the work.